Re: Tuneboy maps for Tiger? I believe that there may be tunes on the Speedtriple site that may be ok for the Tiger (same engine, and all that). However, it would require some time to compare the settings in the maps to the Tiger standard/TOR tunes to determine their possible suitability. If these can't be loaded in a Tiger, then it will be possible to change an existing Tiger tune to the S3 values - it would just take a little time to change the map values. The beauty of the Tuneboy, of course, is that you can easily replace a tune if it doesn't feel right. Yes, it would be cheaper to have the dealer change the tune, if that's all you want and it's likely to be a one-off. Should your diagnostic light on the bike come on, however, and you have to visit the dealer because of it, then you've probably exceeded the cost of the Tuneboy then and there! On the other hand, if you're not the sort of rider who likes to tinker with his bike, or fix things himself, then a Tuneboy is not for you! It gives you the potential to do a lot of damage to the engine if you're not careful. I'm still waiting for mine to be delivered. I'm a complete novice when it comes to EFI mapping, but I've been doing a lot of reading on other forums and it's a fascinating subject, being able to see how the CPU has been programmed for different conditions. I haven't changed my exhaust, nor do I see any need to, but I'm quite sure the engine can be tweaked a bit, here and there, to make it run smoother. It also reduces my dependance on the dealer, should a problem arise in the future. Having said all that, however, only you can decide whether it will be value-for-money in your particular case. If you're happy with the bike as is, and intend going to the dealer for servicing etc. then it's doubtful a Tuneboy will be of much value to you. Buy something else instead . My bike is basically stock (except for the tonne or so of extras I've added). It's fine at cruising speed, and has more than enough power for my needs, but around town at slow speeds it's rough and jerky. I've adjusted the chain, the throttle cable feels fine, so the next step is the mapping, hence the need for a Tuneboy. IMHO, the TOR tune is great if you have a pretty "open" aftermarket exhaust. Mine is a Quill T3, which is fairly quiet and I found the TOR tune to be a bit too rich at lower throttle and low rpms, which made it a bit blubbery and soft. At wide open throttle, higher rpms, it was great. So I found myself needing something in between the stock tune and TOR tune - therefore the need for the Tuneboy. I did a lot of seat-of-the-pants testing and tweaking, tweaking, tweaking, until I came up with something I liked. Would've been great to do it on a dyno, if only. Good solution for me, but YMMV. Maybe we need a Tuneboy "sticky" where members can post their maps? S3 modified snorkels, Pipercross foam air filter, TOR tune and Campbell exhaust. I find it rich at low RPM, breathes much better and a lot more responsive. So it would be a good idea to adjust F/A mixture low down. I'm also at 1600m above sea level! but I still can't warrent Au$399 for a one time adjustment. SF, don't forget you can also use it to do your throttlebody adjustments for the 6k and 18k, as well as diable the air sensor to keep it opne loop under 5k and remove the jerkiness. And the speedo fix is great as well. Also clearing the engine loght and reading codes never hurts. I did have an issue though when rmoving the airbox in that the throttle body would not read, so still need to fix that. I amonly off by one number on 1 cyclinder so not a big deal. Ok, so I bit the bullet and ordered one. The transaction went through on paypal even though It was a day later than the cutoff so hoping it went through. I will be asking loads of questions once it arrives so get ready to type a lot guys. So you couldn't help yourself, silverfish I know where you're coming from, I thought long and hard about parting with the cash but I think it will be money well spent (although I could have bought a gel seat instead ). I checked shanexman's listing and I see you're on it. I'm particularly interested in turning off the O2 sensor, as there have been reports of it smoothing the engine out at low speeds. 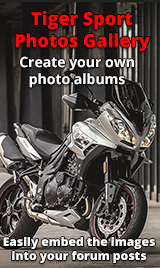 As I may have mentioned, there are a lot of posts on www.thespeedtriple.com site regarding using Tuneboy, should keep you amused for quite a while.